Although the warmer air that moves in the ground is still very cold, even in places where it did not snow or rain on Thursday, we have spotty black ice to start our Friday. Temperatures starting the day much warmer than 24 hours ago, more like 15 to 25 degrees above zero Friday. Under a mixture of sun and clouds, we are mostly dry with a high temperature near 40 degrees. Late in the day, we may have a few rain or snow showers in far northern Vermont and northern New Hampshire. The weekend forecast has really been a work in progress, and it’s still not the highest degree of confidence. Low pressure moving off the mid-Atlantic states may clip southern New England with some rain Friday night and first thing Saturday. At the same time, a front crossing northern New England will bring in drier air. 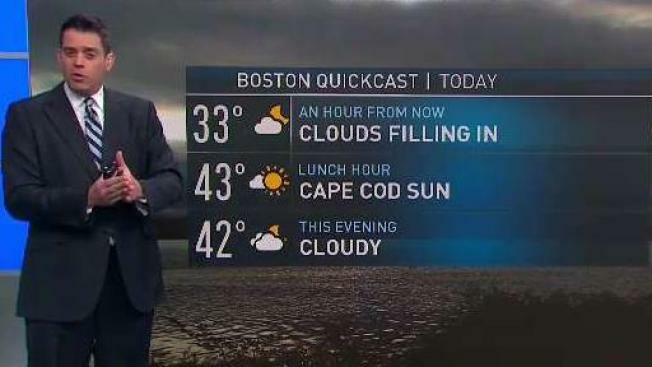 For most of New England, we probably end up dry with temperatures warming to near 50 degrees, especially where the sun may come out in central New England. Saturday night looks mostly dry with a low temperature close to freezing. Additional low pressure, an upper-level low moving out of Pennsylvania, will bring clouds back in during the day on Sunday. In addition to that, the wind will shift and come in from the northeast for a colder day with a high temperature close to 40 degrees. Rain likely redevelops late in the day or evening in southern and western New England. It will also be turning colder up in the sky and in the hills, rain will change to snow overnight. Monday features strengthening low pressure in the gulf of Maine, perhaps with lingering rain and snow as temperatures cool through the 30s. The hills of New England may get coated in snow Monday; even the coast may get some snow. Monday night and Tuesday, that low system in the gulf of Maine will strengthen and wind will increase out of Canada as temperatures go back down to the teens and low 20s on Tuesday morning. We should have a good amount of sunshine, but also very windy and cold Tuesday with a high temperature in the 20s to low 30s. There will be more action again late next week, and it could go either way with rain and/or snow.